This patient had been involved in an accident where he had fractured a number of front teeth. He attended his own dentist who made him ‘dentally fit’ by removing the nerve from a tooth and restoring it with a crown. The patient was not happy with the resulting appearance of his teeth. He found that this affected his confidence so that he was not socializing as much. He had lost his job about the same time and he felt that he did not wish to attend interviews with his teeth in such a poor condition. After a recommendation he attended The Grange Dental Care where we discussed the appearance of his teeth and how they were affecting him. We discussed the possibility of orthodontics which he was not keen to pursue. We carried out a wax up of models of the gentleman’s teeth to what he wished them to look like. From these we were able to make provisional crowns so he could ‘try his new smile on’ for a couple of weeks before completion. 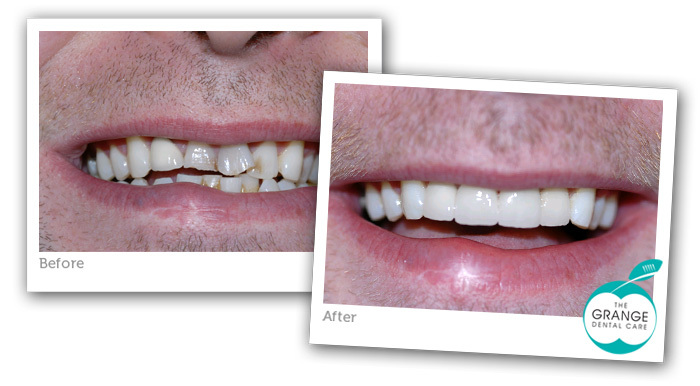 The final work comprised of tray based tooth whitening, hygiene programme and non metal, Procera crowns on his front four teeth. These crowns are very strong but give a more natural appearance than the more conventional crowns. The course of treatment took 6 weeks to complete.